Russia is developing some sort of hypersonic warhead for use on its new Sarmat heavy ICBM. This is advertised as an effective countermeasure to American anti-missile interceptors. The Russians are working hard to put the hype back into hypersonic, but it is unclear precisely how this new warhead is expected to evade missile defense interceptors. As best as one can imagine, the vehicle would perform a trans-atmospheric trajectory in which the flight altitude was typically too deep in the atmosphere for exo-atmospheric kill vehicles to conduct an intercept. The hypersonic vehicle would be initially boosted to high speed by an ICBM, and then continue under its own power, skipping along the top of the atmosphere. Extremely maneuverable, ultra-fast and elusive, the hypersonic Yu-71 can break through any missile defense system, military experts said. Russia has reportedly carried out four tests by June 2015. Russia is test-launching a new hypersonic attack aircraft that can carry nuclear warheads and penetrate missile defense systems, US media said citing a report by Jane’s Information Group. The development of the Yu-71 vehicle took several years, and Russia reportedly conducted the most recent test flight on 26 February 2015, with an SS-19 missile trying to deliver the Yu-71 to space. The new hypersonic aircraft is part of Moscow’s plans to modernize its Strategic Missile Forces. The Jane's authors assume that Russia may put into service up to 24 nuclear-capable Yu-71 aircraft between 2020 and 2025. Moreover, by that time Russia may have developed the Sarmat - a new ICBM that will carry the new hypersonic device. The report also said that Russia's next generation strategic stealth bomber PAK DA will carry hypersonic cruise missiles. China had tested its hypersonic strike vehicle Wu-14 at least four times since January 2014, seriously alarming the Pentagon, as the device may reportedly neutralize the US anti-missile shield. 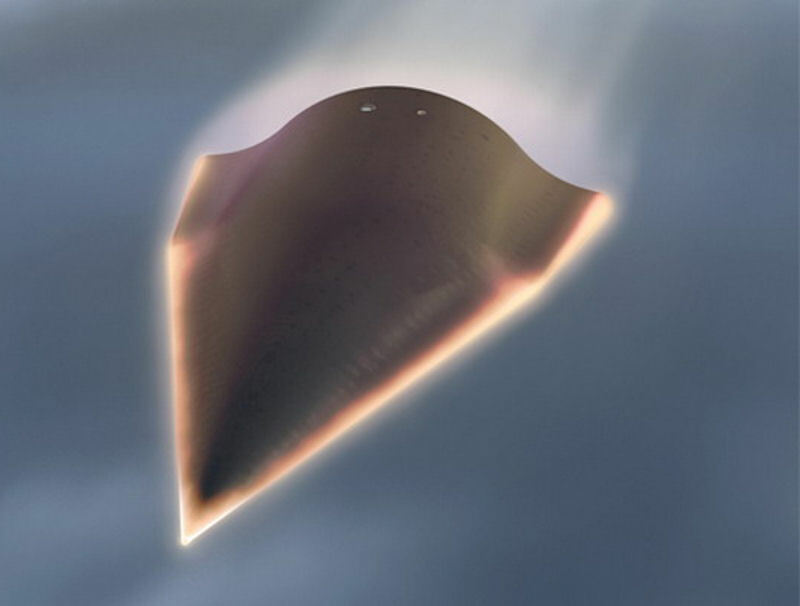 The United States was also engineering a similar device AHW (Advanced Hypersonic Weapon) as a part of its Prompt Global Strike program, which is not covered by the 2010 New START Treaty with Russia. Jane's experts predicted that Moscow may use the new hypersonic aircraft as an ace in the sleeve during arms control talks with Washington. According to analytical website Ostkraft.ru, in 2016 Russia successfully tested its experimental Yu-74 hypersonic glide vehicle. The Yu-74 was carried by the intercontinental-range RS-18A (NATO codename: SS-19 Stiletto) ballistic missile system. The glider was launched from the Dombarovsky missile base in the Orenburg region and hit a target located at Kura Missile Test Range in northern Kamchatka region, the Russian Far East. The Yu-74 system specification as well as the details of the test remains top secret. Reportedly, the gliders are developed to be loaded onto Russia's RS-28 Sarmat (SS-X-30 by NATO classification) – the state-of-the-art heavy liquid-propelled intercontinental ballistic missiles which are currently being developed for the Russian army. Reports that the new ICBM was designed to carry up to 24 nuclear-loaded Yu-74 gliders seem far fetched, and this may refer to the total number of ICBMs to be equipped with these warheads. It was claimed that each Sarmat ballistic missile will be able to hit any target located within a 6,200 mile radius in one hour. Each Yu-74 glider can be equipped with a nuclear warhead, electronic warfare (EW) applications or false target simulators. "These features guarantee penetration of any existing and prospective missile defense system of a potential adversary. By adopting such systems Russia's Strategic Missile Forces will significantly increase their efficiency," Russian analysts emphasize. The website also called attention to the fact that the project aimed at creating Russia's hypersonic air-launched cruise missiles has also entered its final phase. 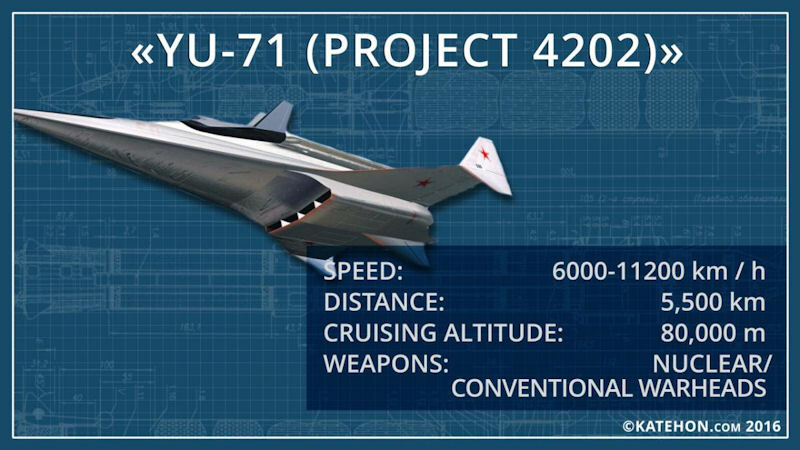 Reportedly, new hypersonic cruise missiles will be in many respects similar to the Yu-74. Ostkraft analysts emphasize that the Yu-74 gliders would not only evade NATO's missile defense systems but will be also capable of penetrating through the US THAAD shield. The analysts argue that while the Terminal High Altitude Area Defense (THAAD) system is effective in intercepting outdated R-17 Elbrus tactical ballistic missiles, it is potentially vulnerable to the threat posed by advanced missile systems. The Russian military has successfully tested a new hypersonic weapon, currently known as "object 4202." Defense analyst Victor Litovkin told Radio Sputnik 29 October 2016 that the cutting-edge warhead is expected to be fitted onto the Sarmat intercontinental ballistic missiles (ICBM). "This was the second test of hypersonic warheads for the Sarmat. The first was carried out several months ago on the Kapustin Yar site," he said. Litovkin explained that the latest test was conducted using the R-36 Voevoda ICBM. 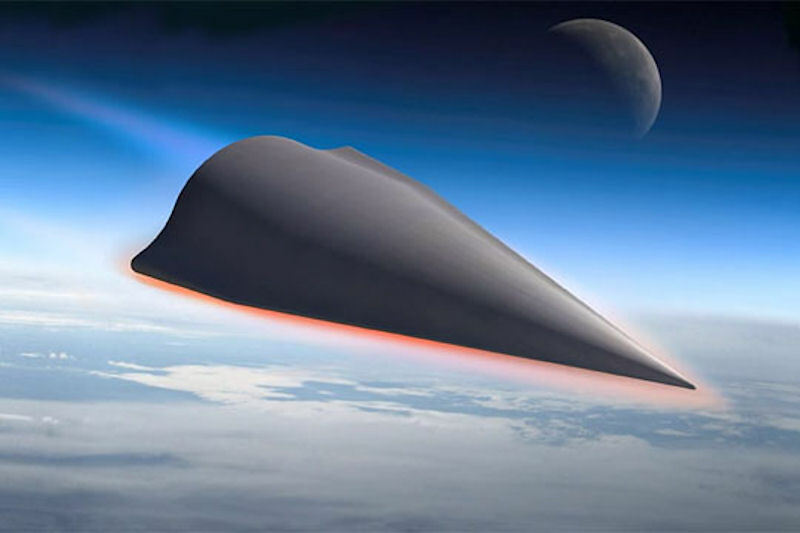 In case of successful completion of Russia’s leading development work “4202" for the development and creation of hypersonic aircraft, created by the US global missile defense system would be meaningless. This was announced on 22 July 2015, by a source familiar with the situation. “If Russia will have an aircraft that has already gained fame as “object 4202", capable of hypersonic speed to maneuver the pitch (vertical plane) and yaw (horizontal plane), our country will be able to solve the problem of guaranteed overcome any prospective missile defense system”, the source said. The Sarmat liquid-fueled, MIRV-equipped, super-heavy thermonuclear armed ICBM is meant as a replacement for the R-36 family. The first image of the new missile was unveiled earlier this month. "Technical characteristics of the [new hypersonic weapon] are classified, but I can assume that there are up to 20 independently targetable warheads. Each of them has its own flight program. They fly like cruise missiles but at hypersonic speeds," he detailed. "People in Siberia mistook them for meteorites." The new Russian-made weapon is capable of accelerating to a maximum speed of 15 Mach (7 kilometers per second). It is intended for the most advanced intercontinental ballistic missiles in Moscow's arsenal. The warhead was created using solely Russian-made components, including on-board equipment, electronic components and the guidance system, an unnamed source at the Roscosmos State Corporation told Izvestiya. Litovkin further said that "object 4202" has been in development since the Soviet era, but initial concepts and ideas were not completed before the end of the Cold War. "The fact that all of this has been restored, that it is working is great. We are standing on the shoulders of giants. It's great that we have these founders and we can use their research to ensure national security," he said. The defense analyst pointed out that Russia is spending ten times less that the United States on defense, including research and development. "Nevertheless, we have produced weapons that bring the entire US missile defense system to nothing," he said. "Today we have new means of penetrating air defense complexes that we can be proud of. Not a single missile defense system [in the Pentagon's arsenal] will be able to withstand our missiles. Let Americans, if they want, throw money down the drain," he said. Russian defense analyst Vladimir Tuchkov noted "As for Project 4202, it appears that this system will be able to meet and surpass the speeds discussed by Tactical Missiles Corporation's director. This missile too is being developed by the NPO Machine Building plant. To be more precise – this is not an independent missile, but rather a warhead onboard an intercontinental ballistic missile, which, after separation from the launch vehicle, acts like a hypersonic cruise missile would, maneuvering freely to determine direction and pitch." 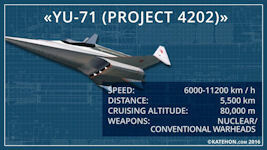 According to informed estimates, Project 4202 is capable of speeds between Mach 7 and Mach 12. For this reason, Tuchkov noted, the system can overcome "not only modern means of US missile defense, but even those systems which American engineers have not even begun to develop yet." The testing of Russia's hypersonic gliders is taking place using the tried and true RS-18B 'Stiletto' silo-based ICBMs, used to accelerate them up to the appropriate speed. "After being adopted by the military, Project 4202 will be installed aboard the new RS-28 Sarmat, and on future Russian ICBM designs. This is expected to take place between 2020 and 2025. When the expected first batch of 20 supersonic warheads is rolled out, it will effectively make the US missile defense system pointless. Every Sarmat will feature three hypersonic combat gliders."